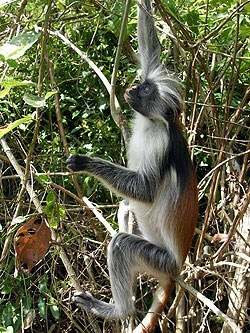 The Jozani-Chwaka Bay National Park was established in 2004, occupying an area of 5000 hectares. 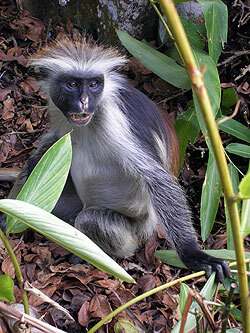 It is the only National Park of its kind in the Zanzibar and a rich mosaic of the island’s diverse natural habitats. 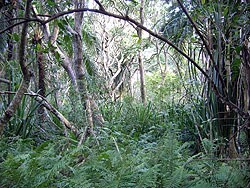 c) The Jozani Forest itself. 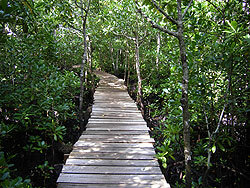 Consisting of marked trails that will allow you to have close contact with the fauna and flora which once covered most of the island and today are to be found nowhere else. 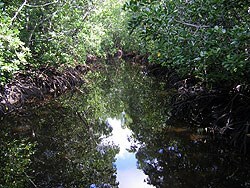 The park lies 35 Km SE from Stone Town and is easily accessible by private car, Daladala or taxi. The entrance gate is 2 Km after the village of "Pete", along the road to Paje. The geocache consists of a rectangular wooden box (15x25x15 cm - see photo) which can be asked for at the park’s RECEPTION. To claim the cache you do not need to visit the park but you are strongly advised to do so since it’s surely one of the most valuable points of interest in Zanzibar. The ticket fee (Sept. 2006) is of 8 USD per person, including guidance. The park is open all year around, from 7:30 am to 5:00 pm. If you go there during the rainy season make sure you take appropriate footwear, since the Jozani forest naturally becomes somewhat boggy. NFX/QRZNAQ sbe gur trbpnpur pbagnvare (n jbbqra obk - frr cubgb) ng gur ERPRCGVBA bs gur Cnex.